A very nice, filling but nutritious salad. I rarely use black-eyed peas so this was a somewhat unique salad for me. It's lovely with the tuna. I served it with wedges of hard boiled eggs and sliced avocado. "Whirling dervish and a true virtuoso"...is how Bon Appétit described Steven Raichlen, an award-winning food writer who presents the very best of the new Florida cuisine. 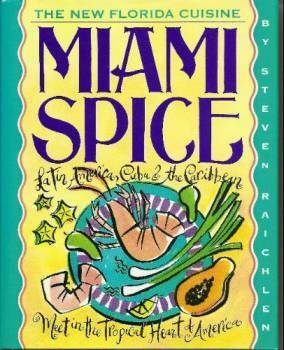 In over 200 recipes, he captures the bursting tropical flavors and exuberant combinations that arise when Latin and Caribbean cooking meet Florida's native cornucopia--the stone crab, mameys, snapper, blood oranges, and other exotic ingredients. In MIAMI SPICE, there are Conch Fritters and Plaintain "Spiders," a Macadamia-Crusted Pompano and Jamaican Jerk Rack of Lamb, Chocolate-Banana Sin Cake and Cuban Coffee Brulée. It's hot! hot! hot!